Lest you think my husband and I do all this cooking unsupervised, meet our kitchen watchcat, Griffin. Every day when I’m puttering around at the stove or kitchen island, Griffin gets up on this stool and watches me very very closely. 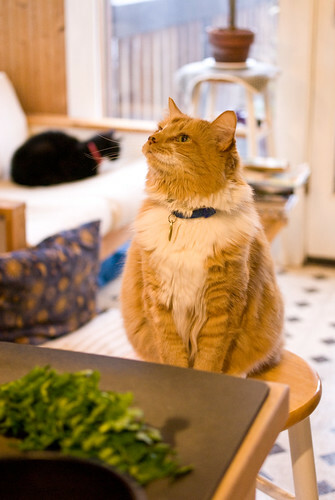 Although he can be distracted – sometimes we need to move the stool further away from the counter to keep him from licking the butter or the lamb chops or whatever is set out at the moment. But it does put him at a great height for snuggles and brisket scritches. And he is a very scritchable cat. awww. my molly kitty watches me cook too, either from on top of the cabinets looking down, or sitting RIGHT BEHIND MY FEET so i step on her when i turn around.